You bet pigs can talk. To each other. To us. Do we listen? Most don't. Sandra Edwards does. It's much more than an "oink oink here, and an oink oink there" to Dr. Edwards. As a professor of agriculture at Newcastle University, she studies what her porcine subjects are saying non-verbally, especially about their living accommodations. 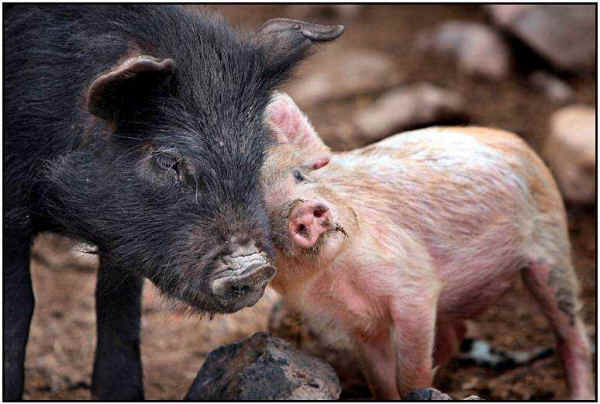 In a July 28, 2010 report Dr. Douglas explains, "Our research, for the first time, provides an insight into pigs' subjective emotional state and this will help scientists and farmers to continue to improve the lives of their pigs in the future." The methodology was simple. They taught pigs to expect a treat when they heard one sound, and something harmless but unpleasant when hearing another sound. Half were then moved to an enriched environment while the remainder moved into typical plain stalls. Thus divided, the pigs were exposed to a new "ambiguous" sound. Those in the better housing were curious to see if that might also signal a treat. The others were more lethargic and pessimistic. OK, so they react like we would. Our environment demonstrably influences our expectations. "Although techniques exist to measure stress, in the past we haven't been able to directly ask a pig if it is happy or not," Dr. Edwards said. Most assessments of a pig's inner state has been "...based purely on human perceptions and our best interpretations of behavior." Anecdotally, though, people who keep pigs as pets and spend time with their animals say it is obvious when an individual is happy or not. They also readily testify to the range of information their pigs give to them about things that concern pigs. And about their feelings toward their people. They are every bit as communicative as dogs, and perhaps smarter, some will assure you. This body language or subtle mode of "speaking" was the subject of another study a few years earlier at the Scottish Agricultural College. There, Françoise Wemelsfelder pioneered a line of inquiry. She called it "Free Choice Profiling." Wemelsfelder captured videos of pigs interacting with each other, with humans and with their environment. She then asked different groups of people to watch and provide words that describe the behavioral style in each circumstance. "Nervous," "forceful," "playful," "curious" might be examples. The observers were mixed in their experience with animals. Some had little or no previous exposure to pigs. Yet there was more than just significant agreement between their assessments of each pig's behavior. Subtle clues that humans find familiar? Intuition? Either way, it is cross species communication. It is still true that most research, like these examples, goes toward using animals more efficiently. A happy (or at least happier) pig is more profitable thus improving their conditions achieves a better return on investment. The animal industry is also funding such studies because it recognizes the growing public outrage over abusive treatment in production facilities. People are demanding a better quality of life for farmed animals and are gradually shifting their meat purchases to "humanely raised" (whatever that means) products. Happier customers and happier animals thus have economic value. Where I stumble in this scenario is that happy or simply less tormented, the end is the same for the pig. He or she ends up as bacon, hot dogs or ham. Regardless of the motive behind industry-funded studies, however, they do provide value for those who see other animals as more than food. They often demonstrate intelligence, awareness, and social structure. They show that all kinds of farmed species are individuals that can plan, strategize, pretend, have special friends, and participate in a complex social structure. In other words, they show sentience. And that kind of data reinforces the growing awareness of our kinship other animals. Perhaps, even though they aren't meant to undermine meat production, these studies will move us toward a turning point where humans can extend respect and compassion to those we share this planet with. John Thompson is the president and board chair of the Animals and Society Institute (ASI). As an occasional journalist, he writes for magazines and newspapers about animal and environmental issues.